It is possible that CCTV usage could well be viewed as a possible infringement/invasion of your Human Rights under the Human Rights Act 1998. So what do you do if your Neighbor is pointing their CCTV at you? The Human Rights Act of 1998 could assist you and we would advise you to gain thorough advice from a solicitor who has expert specialist knowledge in this area. The right contained in Article 8 is known as a qualified right which means that there may be circumstances in which some interference with it is justifiable. This right means that an individual has the right to the level of personal privacy which is compatible with a democratic society, taking into account the equivalent rights and freedoms of others. Any interference with this right by a public authority may be subject to a test of acceptability. The HRA is superior to all other legislation and should always take first preference. We advise you to seek specialized knowledge from a Solicitor who is an expert within Human Rights Issues and Legislation, it is an extremely complex area of legislation. The technology commonly called HD CCTV implements SMPTE HD-SDI standards from television broadcast technology and can transmit video at 720p or 1080p resolution over RG59 cable to a distance of at least 100 meters. HD CCTV offers the benefit of providing high-resolution (megapixel) video, over conventional analogue coaxial cables. PROVISION-ISR HD CCTV cameras offer a standard resolution of 1080P (1920 x 1080), equivalent to 2, 1 megapixels. 1080P provides over 24-times higher resolution compared with CIF and 6 time higher resolution than D1. While Analogue cameras continue to improve, it is still subject to the limitations of the PAL/NTSC TV format, adopting a new HD standard which enables the camera to push video resolution beyond 700TVL and offering HD quality CCTV. HD CCTV is designed to be a drop-in replacement for existing analogue CCTV, requiring only a change of camera and DVR. Both new and existing installations can use CCTV industry standard coaxial cable (RG/59, RG/6 and RG/11). * HD CCTV is a digital transmission of uncompressed HD video over coaxial cable. * HD video: true 1080P or 720P HD video quality. * Perfect clarity with no analogue noise. * Uncompressed-nearly zero latency and no compression artifacts. * Coax cable: immune to network failure. * Easy upgrade: using same infrastructure as analogue system, just replace camera and DVR. * Familiar user interface: for the installer/operator, no difference between CCTV and HD CCTV except for higher resolution. Provision’s HD-SDI DVR, SA8800, was designed to provide installers and customers with an easy entry point to the world of HD CCTV. It provides, in one chassis, both D1 ports (four channels) and full HD 1080 ports (four channels) allowing you to upgrade your traditional analogue CCTV system to full HD at your convenience. Cameras monitoring a sensitive spot can be replaced first while existing cameras will not require change or adjustment. HD-SDI technology uses the same infrastructure as your existing analogue installation, allowing you to replace your existing cameras and DVR in very little time and with zero configurations. Provision ISR HD DVRs are equipped with powerful CPU core technology to enable processing of four real-time channels at full HD (1080P) and four real-time channels at D1. Our DVR operates with H.264 main profile compression format and advanced industry SOC techniques to ensure real-time recording in each channel and outstanding stability of the system. Provision’s ISR HD-SDI cameras implement the latest video processing technology and provide advanced features: Digital image balancing-delivering accurate picture in all light conditions, WDR capabilities, privacy masking, image effects and more due to true day and night functionality (ICR), DSS (Digital slow shutter), Advanced 3D-DNR (noise reduction) and Smart IR technology (all cameras provide an excellent night performance). High-definition (HD) cameras are the best suited for today’s video surveillance needs. That said, we must remember that all HD cameras are megapixel (MP), but not all megapixel cameras are HD. The biggest difference between a megapixel camera and the high-definition cameras is that HD images use the 16:9 widescreen aspect ratio and megapixel produces images in a 4:3 aspect ratio. HDTV provides a higher resolution and higher resolution translates into more detail, which in turn leads to better possibilities for identification. In addition, a true HDTV network camera provides full frame rate and extended colour fidelity, for an even better viewing experience. To reiterate, all HD cameras are megapixel, but not all megapixel cameras are HD, and good quality, easy installation, and ease of use will set HD apart from standard analogue and MP systems. In retail, theft and shrinkage can be drastically reduced through effective video surveillance. HDTV network cameras have an important role to play, for example by giving an overview – without any blind spots – of shops and stores. HDTV network cameras are typically used in city surveillance situations to provide high-resolution video streams from locations where there is a need to be able to clearly identify people and objects, or get a larger overview. Casinos and airports, together with passport controls, banks and similar high security premises, are areas where the requirements on the surveillance cameras often include high image quality and detail as well as full frame rate, making HDTV network cameras the natural choice. Security and safety for both passengers and staff are highly prioritized issues for public transportation authorities around the world. HDTV cameras at stations, terminals and airports as well as on-board buses and trains, provide valid evidence in the event of criminal incidents. CCTV video baluns, also known as UTP baluns, allow traditional coax cable to be replaced by category 5 and other forms of twisted pair wire in CCTV video camera & surveillance installations. Video baluns allow installers to use more cost effective structured cabling techniques to wire security cameras. By using video baluns, UTP wire such as cat-5 can be run over longer distances easier than coax cable and for less money. Active balun transceivers enable UTP wires for cameras to be run distances up to 3,000 feet. The origin of the word balun is bal(ance) + un(balance). Video baluns, also known as CAT5 baluns. A video balun is placed on both ends of the CAT5 cable run and uses one of the the twisted pairs from the CAT5 cable to transmit the video from the camera to a DVR or monitor. There are also multi-camera baluns that can use the four twisted pairs in CAT5 to transmit the video for up to four cameras. Most security camera installers are familiar with using RG59 coax cable for CCTV, as this is the industry standard cable and allows installers to run both the video from the camera and power to the camera using a single cable run. There are versions of video baluns that also support running power to CCTV cameras in addition to the video. These are some of the most common reasons that a security installer would choose to use CAT-5 cable instead of RG59 for a CCTV application. The distance of the cable run exceeds 700 feet (the maximum distance supported by RG59 without a video amplifier). CAT5 cable typically costs less than RG59 cable. The following types of video baluns are available and used in different circumstances. 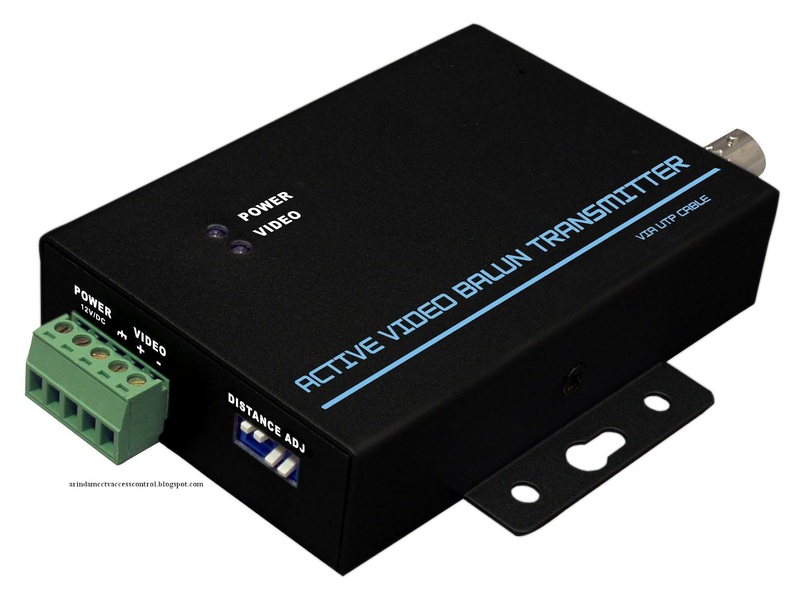 Passive video baluns are not powered and support cable distances up to 1200 feet. These baluns use only one of the twisted pairs in the Cat5 cable. The CAT5 is attached to the baluns on both end using screw terminals or other connection types. 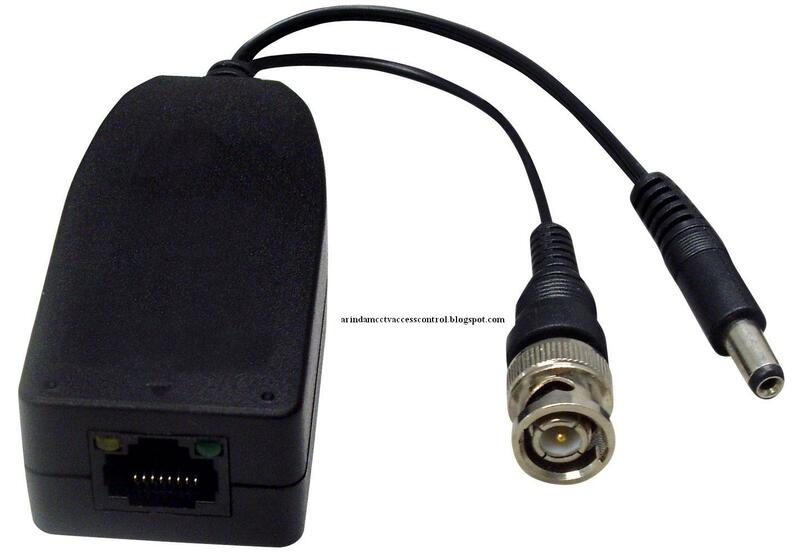 The balun has a BNC connector that gets connected to the camera on one end and a DVR or monitor on the other. Video baluns with power support running low voltage power to CCTV cameras in addition to transmitting the video signal. For baluns that also supply power to cameras, one of the twisted pairs from the CAT5 cable is used for video and 2 pairs are used for power. Installers attach one pair for the positive and one pair for the negative power leads. 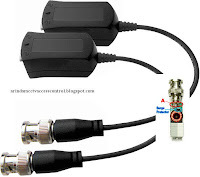 There are also video + power baluns that use RJ-45 connectors instead of the cable terminals, and even some models that support audio as well. Some installers prefer this, especially when using pre-made network cables with the RJ-45 ends already attached. An important note is that the distance that power is unable to be run is much lower than video and is still limited by the voltage and guage of cable being used. 12V DC typically begins to drop after 200 feet. The below video demonstrates how to use passive video baluns with power. Active video baluns include a power supply and act also as an amplifier so that cable distances can be increased beyond 1200 feet (the limit for passive baluns). 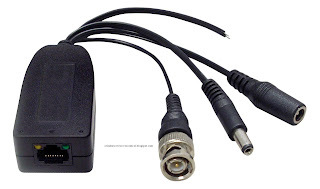 An active balun receiver can be used on the DVR or monitor end of the cable with a passive balun on the camera end to boost the maximum effective distance to 2000 feet. When an active transmitter balun and active receiver balun are used together, the effective distance of the cable increases to 4000 feet for color cameras and 5000 feet for black and white. The below diagram illustrates the wiring used when installing active video baluns. Please note that power is required for both the transmitting and receiving unit.